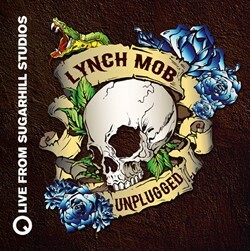 Lynch Mob have posted video footage of their live unplugged performance from from SugarHill Recording Studios. The half-hour show includes an unplugged performance by the band in SugarHilla’s historic “Studio A” as well as an in-depth interview with hosts Dan Workman and Gina Miller. Legendary Dokken guitarist George Lynch, vocalist Oni Logan, bassist Robbie Crane and drummer Brian Tichy, supported by percussionist Tyson Sheth, play a one-of-a-kind acoustic Lynch Mob set. This episode was recorded while Lynch Mob was touring in support of their album Sound Mountain Sessions released on Rat Pak Records. The band performs smokin’, soulful versions of their hits Wicked Sensation, River Of Love, Where Do You Sleep At Night and All I Want. On March 26th Lynch Mob released the EP Unplugged, featuring the same rare acoustic sessions and a bonus 15 minute interview track through Rat Pak Records. The Limited Print Collectors Edition EP is now available for purchase at ratpakrecordsamerica.com/lynchmob..